A Daily Diary: Secondlife Designing Like CRAZY! 7:07 p.m. I'm back. She's BACK! I've been making many an interesting thing...I'm not kidding. Six things uploaded in three days and I've been on a semi-normal sleep schedule. Praise Jesus! Praise God. I was watching the freebie chair all week for my letter to come up. A chair that basically if the lucky letter matches the first letter of your username, you win the prize. I was SECONDS from just buying it instead when the "?" letter came on the chair (meaning any letter can win) and I got these baby bottles and textured them! SO thrilled. I believe God blessed me. Thank/Praise Jesus. Lastly, there was the Castiel cosplay, 'Cassplay' suit that didn't work out. I scrapped all my original plans except to make the Angel blade, the only one I could find on the site, and I am praising God on how it came out!!! Just as well as I hoped! This was also a long while in the making. The last three items were submitted today alone. I've been a very busy girl. So busy that I have sadly given up having time for a relationship and am more focused on God on my creativity. So yeah.. Managed to scrounge up a grocery list, and it's storming, so there's no word on if we are going shopping tonight or not. I am a couple months shy of getting to read that letter I saved. The one where my 21 year old self asks my 26 year old self questions about life. I'm very, very excited to tell that woman what has changed because she never could've believed it (especially LIVING with April when at that time I was forbidden to even see her) so yeah...more soon. The usual, otherwise, is Flight Rising (saved 400K so far and plan to save more on there) Secondlife (Rob bought me 1500 Lindens last night and I've tried not to spend it too quickly. Success.) Scrubs (Still getting through the seasons) April and I argued last night and the end result, I'll say as much, is that we want to work on a closer relationship as I was starting to feel pushed away. For starters we watched a Say Yes to the Dress marathon, commented on the dresses, and that was fun. ^__^ We both want this. I also found more gems in my neighbors trash. 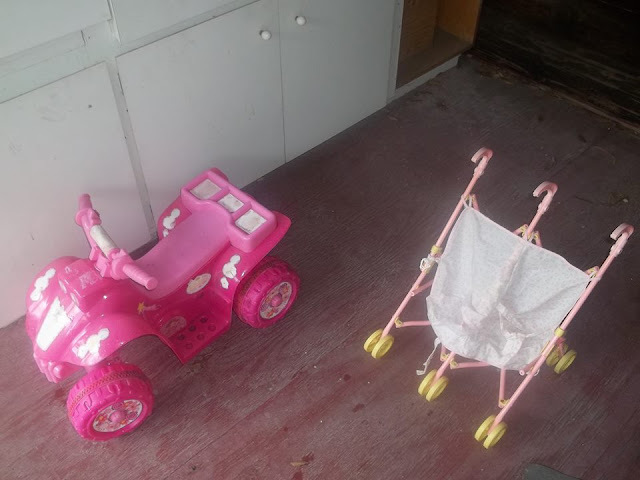 A non-working toddler four wheeler and a double baby doll stroller with a broken strap. I asked Jen if she wanted them, she does, she just has to pick it up. My neighbor throws out a lot of good stuff. Speaking of which, my brother found a flat panel tv in the garbage with no cord. DJ took it home because he had a cord for it and the thing works perfectly! He gave it to my Mom. Seems the year has been going rough but God is actually putting some good stuff our way. Jesus rejoices. My heart goes out to that county clerk, unnamed, who is currently suffering for the sake of righteousness. God be with her in Jesus name, amen! May she stand firm in Christ. 8:03 p.m. Caught up on pinterest. Feeling the need for a nap. I can only assume we aren't shopping tonight judging by the hour, but that is fine. ^^ Jesus loves you. G'nite.